A -The Beginning of Kitten Rescue. It is now over three years ago since I took in one feral cat, which then produced three kittens. It seems that the developing compassion, was the grounding inspiration that caused me to then find homes for a further nine kittens, that ended up on my doorstep the following two years. The story starts form now, November 2013. Works backwards over the last two years, or is that three years counting this one. I am still developing these pages, so do not be surprised if they have changed on your next visit. 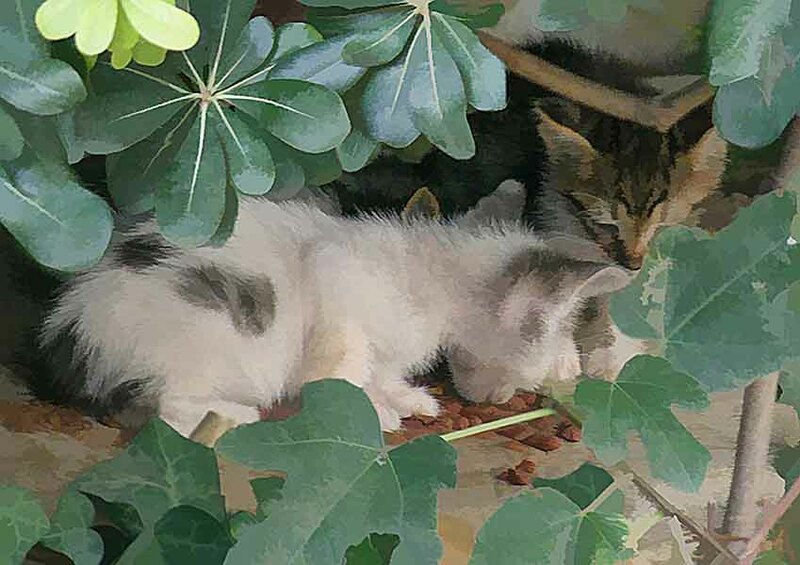 KITTEN RESCUE 3013 – these young kittens in the images below have been born to a feral mother and without the assistance of a kind and understanding hand, the chances are they would not be alive today. Three years ago I took in a black feral female to shelter from the winter, who then had three kittens which I adopted, their story will be told in EnCatlopedia when the book is finished. The next year, four, two-week old kittens were bumped on my doorstep in a box. All four have been found homes after I learnt how to feed and raise them. 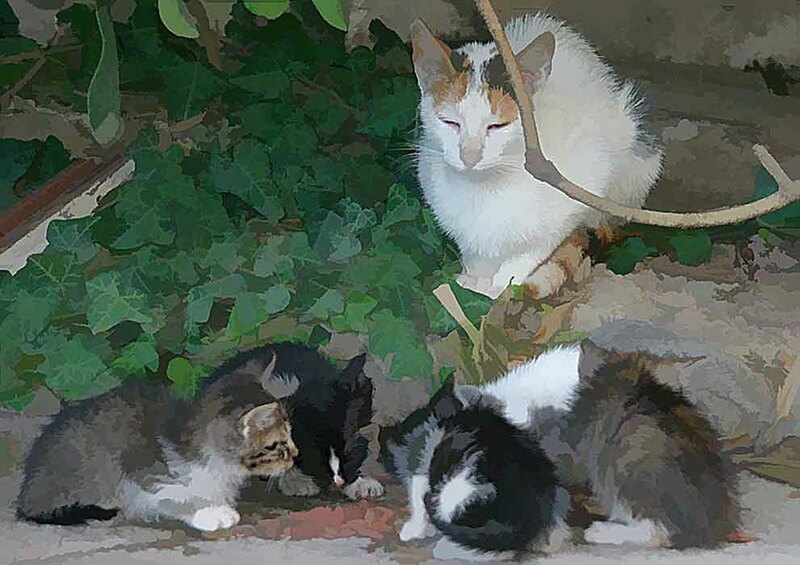 This year five kittens have been born to the feral mother in the grounds surrounding my home. She mothered them through the first few weeks but was undernourished and was beginning to reject them. I gave them a home outside my door and have fed both them and the mother. One died, one went to a home and twelve weeks later I still have three. 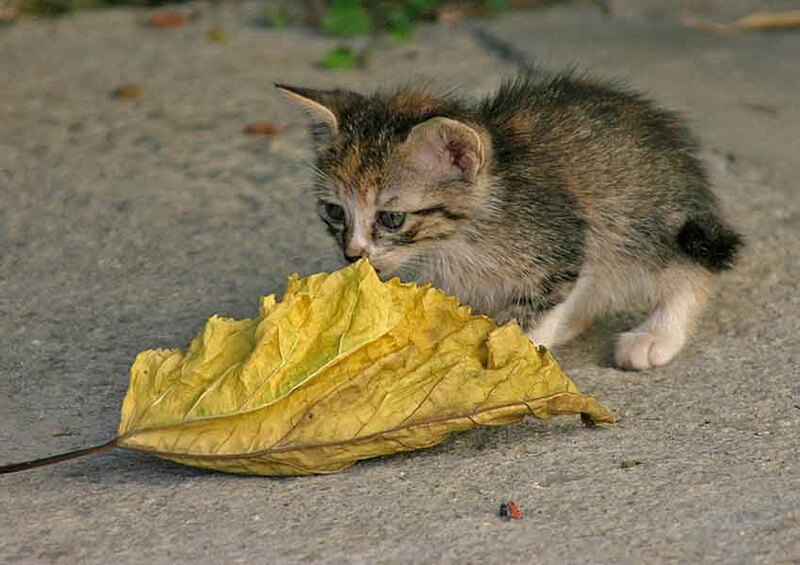 Healthy and full of kitten energy these images capture their young lives. Even though I am desperately short of cash I found small amounts to keep them alive and give them some quality of life. It only costs around 5 euros a week to keep them fed. Unfortunately more to deflea and worm them, then more to have them neutered to stop an explosion in the cat population. They will turn feral if homes are not found for them soon. If I can raise enough money I can continue to feed them, if not the feeding will stop in a few months when they are old enough to look after themselves. I am not a registered charity, just someone kind enough to give a lending hand; I would appreciate any help I can get. Many of the photographs have been turned into a painting style images, like the two below. Maybe this was the bush they were born under. The mother kept moving them around so they were difficult to trace on occasions. 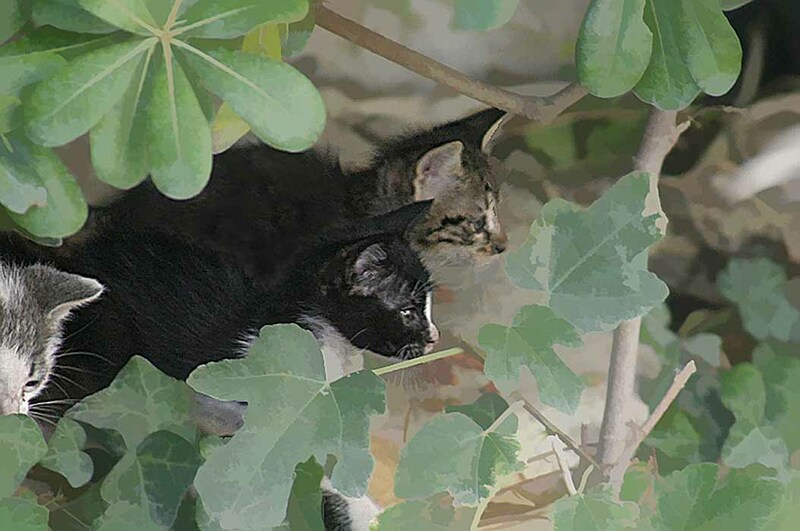 They would hide in the branches for safety when mum was not around. Mum keeping a watchful eye. Hiding in the branches. Under the watchful eye of mum, somewhere around four weeks old, the kittens are getting braver and not hiding so much, and beginning to trust after feeding them for a while. A bit difficult to locate sometimes as mother moves them around to different places. One day under a bush, the next on top of a roof or in some sheltered but accessible storage place, or anywhere she deems safe from meddling hands around these large grounds. She is well undernourished to produce milk for five hungry kittens and has already started rejecting them. Feeding helps her to produce more milk, feeding kittens makes them not so demanding. They take to solid food very quickly even though it is still a bit difficult for them as their teeth have not yet fully developed. Communal meal time gets a little bit like a scrum. 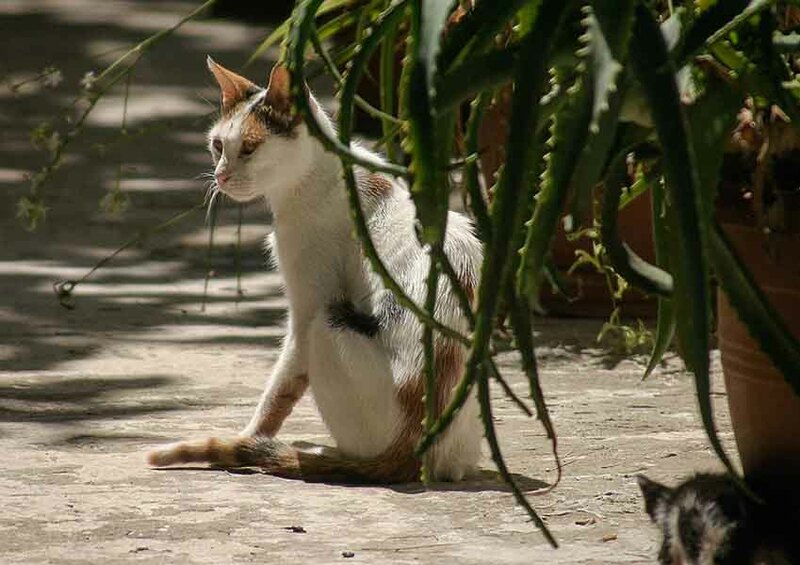 Mum taking in the sun, keeping an eye on playful kittens. Hiding in the bushes and eating from the stone slab under their bush home. 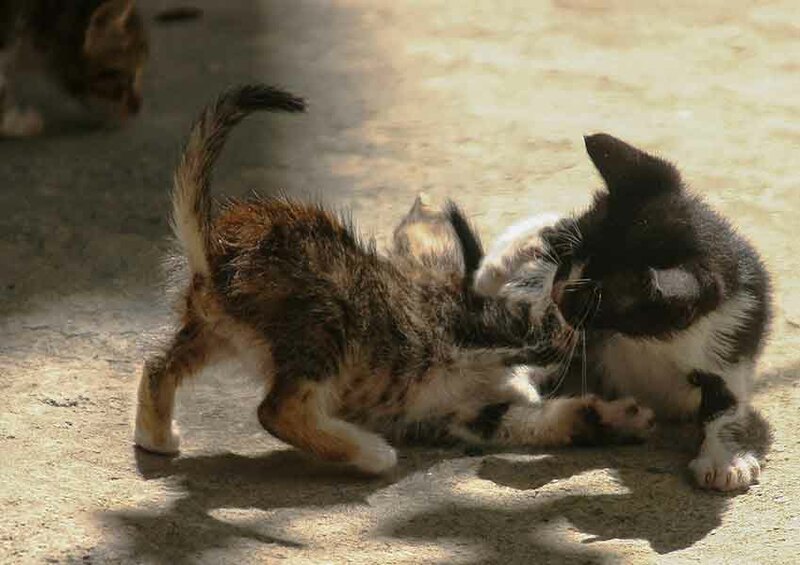 They would play and practice the moves, pouncing, crawling and stalking or just enjoy the summer sun. Practicing cat curiosity seems to be in order on occasions. Or is it really kittenball. So, after much experimentation a plastic dog kennel; one recued cat box from a dumpster, a chair with a box underneath, one dry food cat feeder, feeding bowl, tree and flowers were turned into a safer, stable home. Soft towels placed in each to keep them warm. Out of the three, the box under the chair seems to be preferred. Mum visits every night, and during the day sometimes. They cuddle up as a family in the box when inactive or during bad weather. 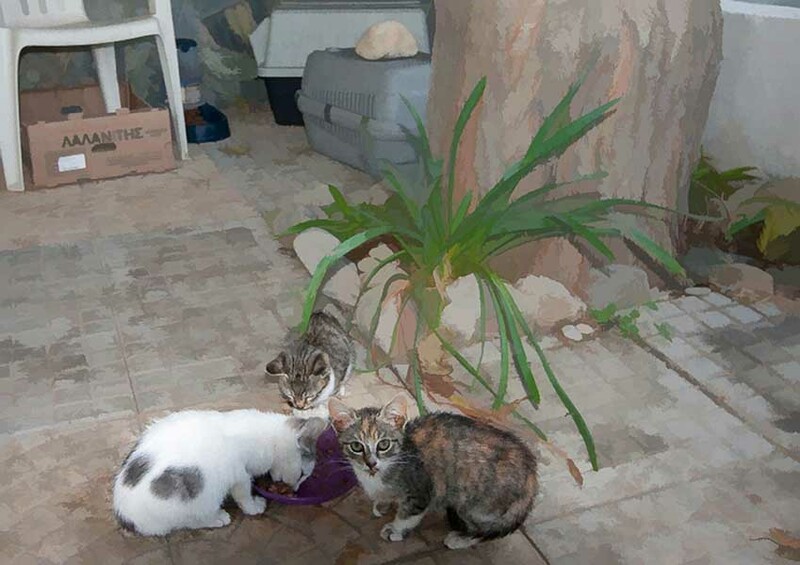 This gives the female the experience of her motherhood, the kittens a mother to relate to, and they get fed twice a day. 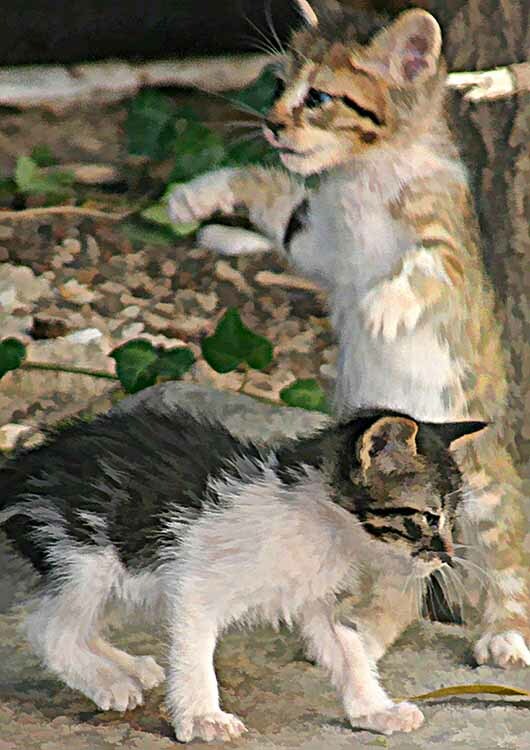 One kitten has already gone to a home, one tragically died when it somehow it got out onto the road, leaving three, now twelve weeks old and are captured in this painting style image. They will hopefully, eventually drift away as they get older, but they will still need feeding for another three months before this support is withdrawn. A more stable home improves their health. Taking it easy now she has found a way to secure the future of her offspring. To say that all was of my own doing is not strictly correct. She had dumped her children on my doorstep on many a morning. I could hear her calls to the young ones long before I would rise. The constant battle of removing them before feeding spanned over many weeks before I gave in. Difficult not to succumb, you have the story so far. 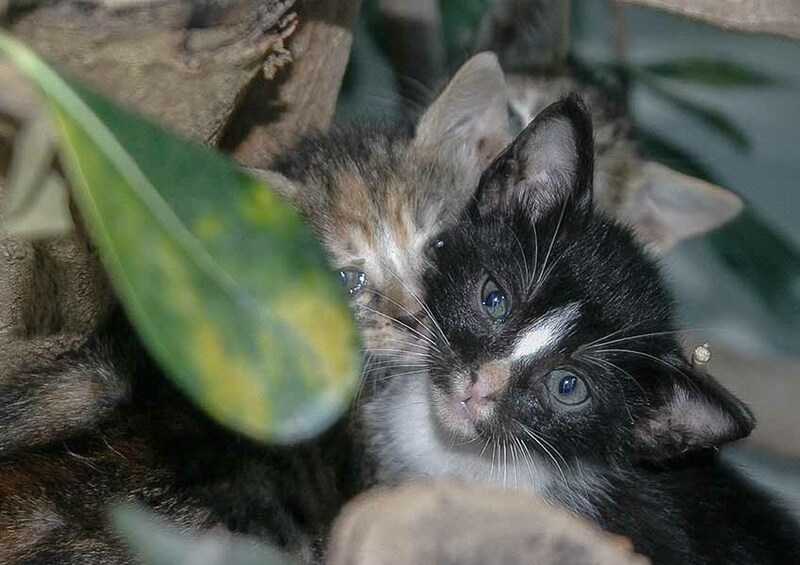 These kittens would not have got this far without help. Weak and hungry, they would have died undernourished as their body temperatures would have dropped to a dangerous level. The cost of neutering the mother needs to be met to stop the process happening again in six months’ time. Giving birth twice a year is dangerous for her health, and the kittens stand little chance of any life. As this is Greece, she will be left to live as she pleases, and will most likely become pregnant again soon. There is no money to get her neutered, even if there was any insight to do so. The cost of the vet bills is too high for many, 110 Euros for one cat. These five would have wondered off or simple died under a bush, or may well have been caught on a road as one has already done so, or eaten something poisonous from a rubbish bin. Their life expectancy, well, if they get through another year without being found a home they are doing well. The next hurdle is the poison put down most winters to thin out the feral cat population. Many die this way, the problem is so vast it cannot be solved. There is only one underfunded Cattery, and that is dependent on volunteers that are not local. 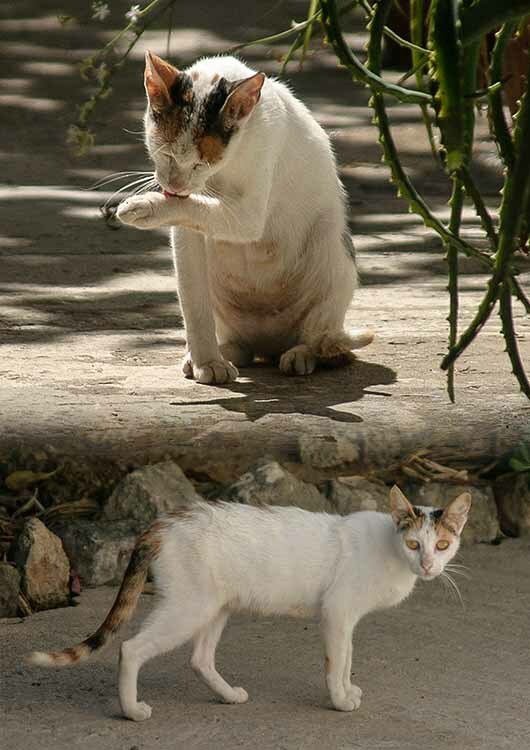 The next avenue of help are people like myself, there are so many cats that everyone who has a compassionate heart for them has a least one, and anything up to ten and more. I now have two in my home and four outside my door. The cost is draining, and I cannot afford to keep them all. The four outside will never be taken to the vet, or receive any medical attention. When they are about six months old I will stop feeding them, they will then become fully feral very quickly and can lose any attraction to human beings. They will be fully subject to the elements such as humans, traffic, diseases and will be difficult to catch from that point onwards.